Ask me to make a dress from a pile of trash and the inspiration flows! Ask me to make one from “normal” fabric and…it’s not quite that easy. Thus, it was an unusual challenge when I was invited to participate in a fashion week event last month in Seattle. Fashion? Couture maybe, but I have a dubious relation with fashion. However, this event was no normal fashion week. 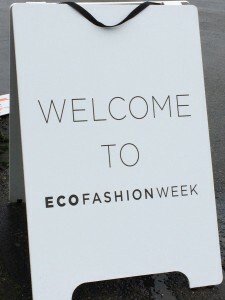 This was ECO FASHION WEEK (#EFW), the world’s largest sustainable fashion event happening, in 2016 for the first time, in Seattle Washington! Originally launched in Vancouver, BC, Canada in 2010, they sought to break into the international market by bringing the event to the US. Held over four days with two jam packed evenings, the event was filled with runway shows, a meet and greet, and a full day of presentations called the Collective Conversation. Meant to explore the environmental and social issues related to the fashion industry, I was invited to both participate as a panelist in the Collective Conversation and to share new work on the runway. The pace was thrilling and exhausting! For the runway portion of EFW, I was one of 10 designers and stylists that participated in the Runway ReImagined: Project 8.1. So there I was in Value Village at 6 o’clock in the morning, standing toe to toe with the other clothing sorters except I was pulling clothing for fabric and labels, not for resale (hence my foray into creating a garment made solely from repurposed “normal” fabric). Individually, each of the 10 designers used 8.1 pounds of recycled clothing to create a small collection of garments. But collectively, we created couture weighing a total of 81 lbs. What is the significance of 81lbs, you may ask? It’s the staggering weight of textiles that the average North American discards annually! Hard to imagine isn’t it? The EPA estimates that 3.8 billion pounds of post-consumer textile waste goes into the landfill every year.1 Luckily most of these textiles we discard — even if they’re worn, torn, or stained — can be recycled! You can even recycle a single shoe! Items simply need to be clean and dry. There are lots of thrift stores happy to take your textiles, such as one of the main sponsors of the 8.1 challenge and Eco-Fashion Week: Value Village (aka Savers, Inc.). The clothing recycling market can reuse and recycle 95% of the enormous amount of apparel that we purchase and discard every year. About 45% of discarded clothes are usable clothing, however, because of the huge glut of clothing in the world only a small percent is resold in secondhand clothing stores. The rest is sent to developing countries for reuse. The other 50% of discarded clothes are turned into a variety of new products where 30% become wiping cloths (used in repair shops, construction, stores, and maintenance or custodial departments) and 20%, when processed back into fibers, are turned into paper, yarn, insulation and carpet padding.2 Unfortunately, of the 81lbs of clothes we throw away every year, the clothing recycling market is only capturing 15%. The rest goes into landfill. However, the disposal of textiles is only one problem with the fashion industry. Let us pause here as our minds conger up images of slim models with hair blowing in the wind, garments unimaginably sleek, revealing sensuality, or audacious juxtaposition usually affordable only through extravagant expense. My first piece in the collection (shown in the images to the left) I created for ECO FASHION WEEK was meant to represent this notion of fashion and the opulence of conspicuous consumption. But let these realms stay in the pages of Vogue, Elle, W, and GQ. The thing is, when I talk about the fashion industry I am also referring to the sneakers worn by 8-year-old boys, T-shirts worn by the guy next door, and the bathrobe worn by your grandma. All our attire including coats, shoes, hats, and accessories are part of this mammoth industry. Which by the way, is the SECOND most polluting industry in the world after oil–YES, the second! This blog post starts a series about fashion and its critical role in the exploitation of resource use and in climate change. 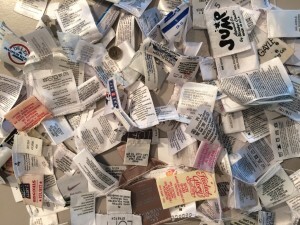 In the series, we will explore 81lbs of waste, pollution and mistreatment from fast fashion, the exportation and globalization of toxicity, and what steps we can take individually and collectively to combat our decreasing value of clothing. I will return to more about my ECO FASHION WEEK collection and performance piece in this series, but first I am going to share with you some of the information I learned in my research preparing for the project. I thought this series a very fitting way to begin the New Year as we open ourselves to resistance against the old ways of thinking that no longer serve us. Continue reading the next post in the series here. Photo Credits: All photos by Nicole Morris, except runway photos by Alfonso Arnold. I am looking forward to your blog series! Love that exquisite gown! Onward with your contributions! The facts are staggering. My perspective of fashion has always been about how the industry contributes to women’s skewed body image. Now this! I was all ready to do something that’s not my usual…go get a Dillards credit card and throw myself into that store on the 26th for their mammoth sale. What was I thinking? Thanks, Nancy and Nicole, for helping find my sanity once again. I hope at some point you will describe the garments you used to create the lovely gown pictured. This is fantastic! Just what I wanted 1) to learn more about the depth of your work and 2) to know what ECO Fashion Week was about. The bonus is learning this is a beginning! 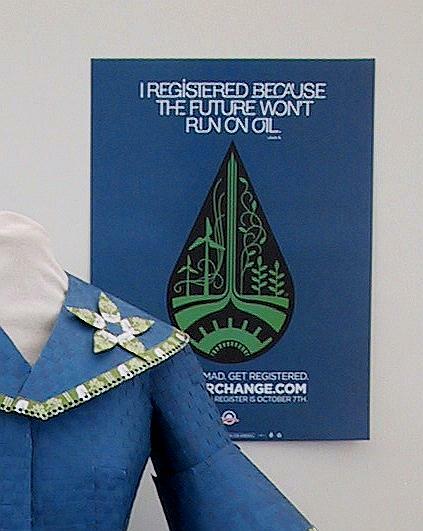 Tell us more about how to manage cloth, clothing and costume in responsible ways. Thanks. Nancy – Your creation is stunning. I think I have given up more than 81 pounds of fabric this year. In getting ready for my move, I gave a large amount of “too big clothes” to the Casa Familia shelter. I doubt they’ll be repurposed but I know there’ll be women who won’t have to buy new pants who’ll be benefit from my recycling. Kudos to you once again on making beautiful fashions. When I purchase clothing, thrift stores are my FIRST CHOICE. I am getting ready to recycle my huge collection of T-shirts, and have been looking for patterns to help me with this endeavor. I think that friendly gatherings to showcase how regular people can repurpose their wardrobe could be fun and encouraging. I even have researched how to make choli’s out of t-shirts as undergarments! I love your blog, because it really speaks to the hard truth about the wastefulness of our clothing/textiles industry, and as a consumer, being informed means I am empowered to make informed decisions. I look forward to the next posting. Many thanks!! Great start of a new series. I look forward for the next excerpt. Happy New Year!